Dr Séamus was always fascinated by science growing up in Tipperary, thriving in human anatomy and biology throughout school. With his passion for health sciences, he knew he wanted to find a career in a field where he could help people through science. Dr Séamus attended chiropractic college at Anglo-European College of Chiropractic. 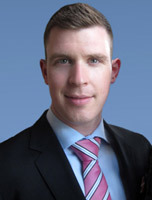 He joined the Dun Laoghaire Chiropractic team in 2014.